The dinner party may have been in your diary for weeks, but if you’re still clueless on what to prepare, look no further. Flavour, creativity, authenticity and ease, we have the perfect Colombian recipe for you… and you don’t even need to jet off to get your inspiration either (although we recommend you do at some point). As soon as we came back from this deliciously rich, cultural country, we wanted to recreate every meal we had. So here’s just one of the many that will transport you and your dinner guests to Latin America. 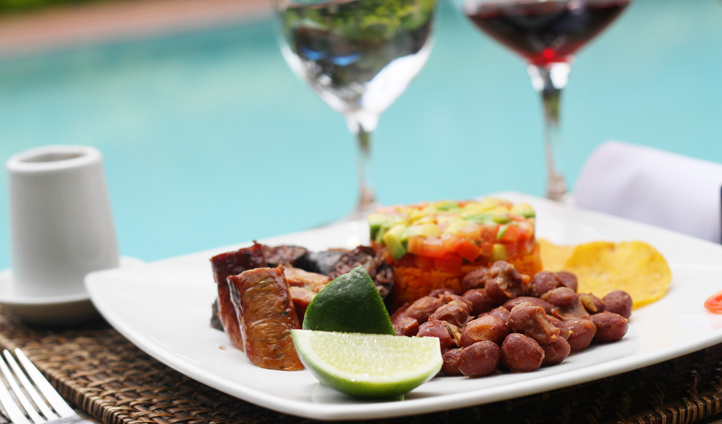 A national dish that is as flavoursome as it is easy, here’s how to create Bandeja Paisa. Like all Central American dishes, start with warming the traditional refried beans (we like to add a sprinkle of chilli for a spicy kick) and pop a plantain in the oven to bake. Next, pan fry the shredded beef, pork belly and chopped chorizo, followed by frying your eggs sunny side up. Once all warm, throw onto a plate with rice and garnish your dish with lime and avocado dressing and hot hot salsa. It may not be a Michelin technique but the flavours will blow your guests away, leaving you more time to drink and dance the Colombian way (much more important than actual cooking we think).